The region’s most lucrative and glamorous horse-racing event, the ultra-rich Diamond Mile, sponsored by the Betting, Gaming and Lotteries Commission (BGLC) in partnership with Supreme Ventures Limited (SVL) and its subsidiary Supreme Ventures Racing and Entertainment Limited (SVREL), is set for Saturday, December 1. The announcement for the fourth staging of the event was made by the organisers at a press conference held at the offices of the BGLC on Hagley Park Road yesterday. The Diamond Mile for 2018 carries a total purse of US$115,000 (over J$14 million) and the remaining races on the card will have purses of $1 million and over, making the race day the richest in the English-speaking Caribbean. The Diamond Mile is competed over eight furlongs or 1,600 metres. The first two Diamond Mile races were won by the Derrick Smith-owned, Wayne DaCosta-trained and Omar Walker-ridden Seeking My Dream with She’s A Maneater, also from the DaCosta barn, taking last year’s event with an electrifying run. She’s A Maneater is bred and owned by Winston Kong and was ridden to victory by Dane Nelson. While this year’s Diamond Mile promises to be bigger and better, Vitus Evans, executive director at BGLC, said that his company will again invest $20 million to the purses on Diamond Mile Race Day. “We will again invest $20 million towards the purses so that the race day remains the richest in the English-speaking Caribbean with US$115,000 for the Diamond Mile championship. “The commission’s team is already collaborating with the SVL team to deliver another spectacular day at the races for the 2018 Diamond Mile. We will again provide an unparalleled experience for horse-racing fans which brings together the excitement of the races with the best in food, fashion and entertainment,” Evans said. 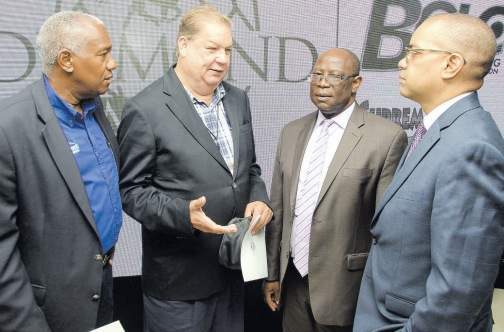 Evans further stated that it would be another sign of success if corporate Jamaica capitalised on the opportunity to connect with the racing fans and come on board for the Diamond Mile in making the event an extra-special day. “When you look at the list of industries represented by the companies that have come on board to support the Diamond Mile over the past three years, there have been sponsors representing the food and beverage industry, construction, transportation, media, entertainment, hospitality and tourism. “We are very grateful to these companies who have recognised the opportunity to align their brands with the Diamond Mile. For 2018, we will build on this by renewing the existing partnerships and we will forge new ones with other corporate entities,” said Evans. Brando Hayden, chief operating officer (COO) at SVREL, gave his company’s commitment to the Diamond Mile and thanked BGLC for the platform set in helping to develop the racing product. “The Diamond Mile is now the marquee event on the racing calendar and the social calendar as well. Its creation and subsistence growth brought great purpose and promise to the industry. “The SVL group remains a very proud partner to the richest race in the English-speaking Caribbean, the ultimate platform for showcasing our best talent on and off the track. I would like to thank the BGLC for delivering on its vision to support the growth and development of the horse-racing industry,” Hayden said.